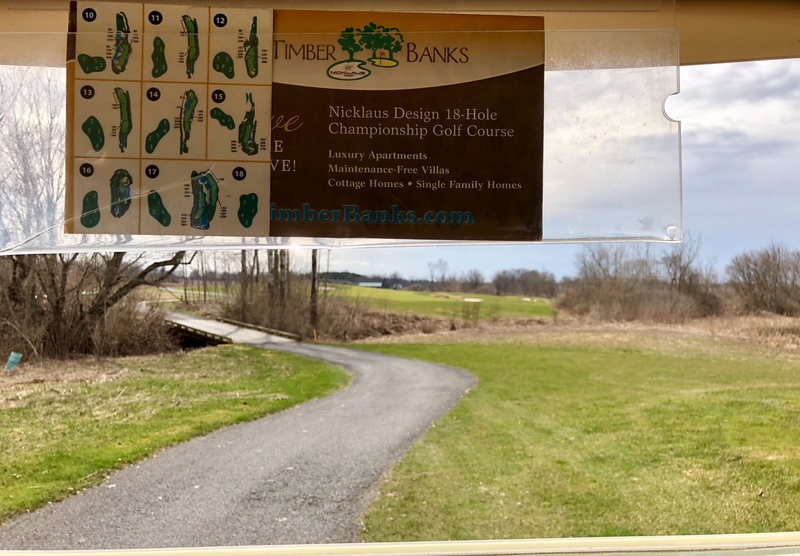 Tuesday was sunny and warm, so we stood by the first tee of Timber Banks ready to play spring golf in Central New York again. 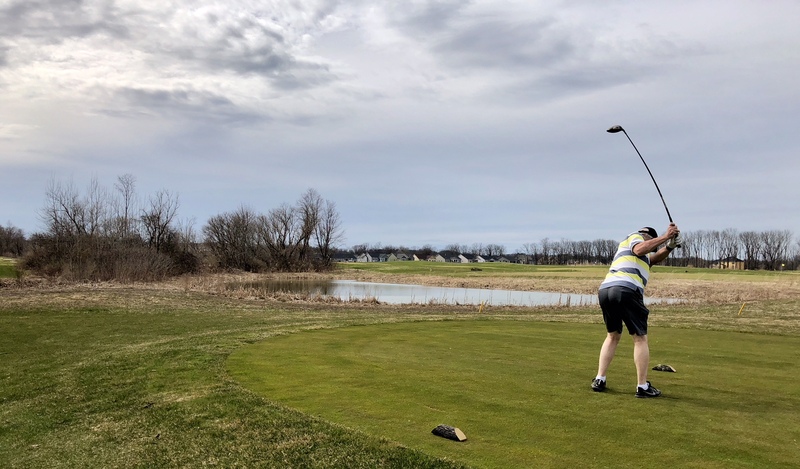 Never before had we started our golf season off with two rounds on consecutive days, I thought as KP and I prepared to hit our first shots on the Jack Nicklaus-designed course. Ready for the opening drive, I am. 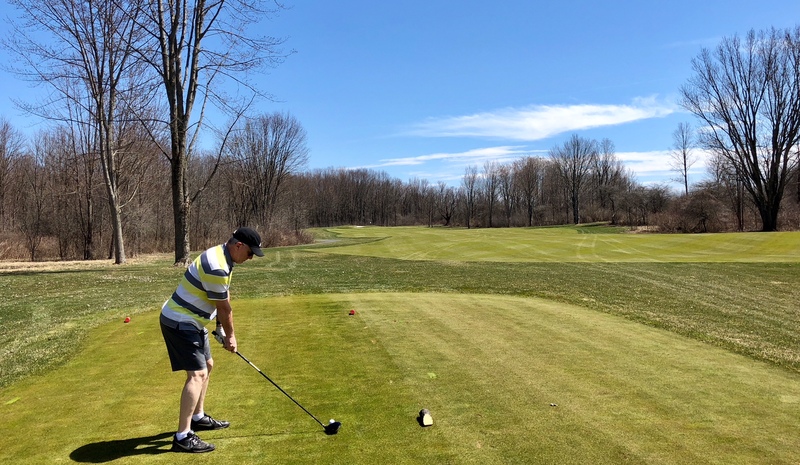 I mentioned to my friend that the last time I’d played golf two straight days was when we drove to Pennsylvania and accepted the invitation from our pal Ago to tee it up with his Long Island Players Club. That was in 2011, I know for certain, because my Chevy Cruze was several years old when we took it for the trip, and that is its model year. KP still has the tag the group gave him on his golf bag. We played three straight days down there, enjoying the fine old course, resort, reunion with Ago and meeting new friends. 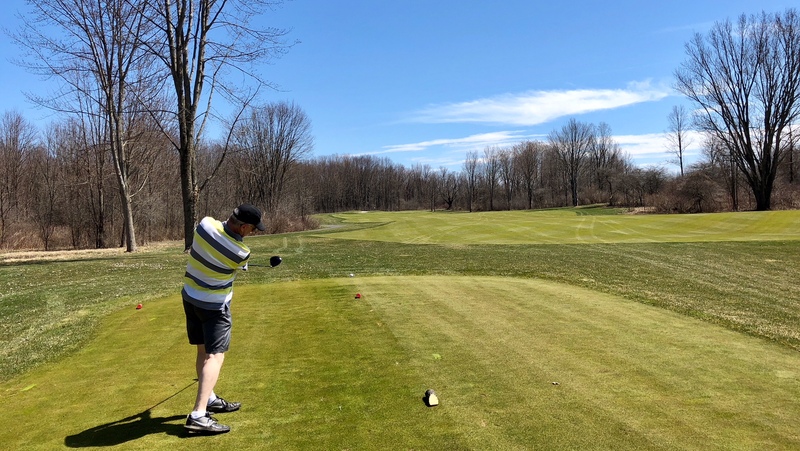 The round we were paired with Ago and his partner Vic quickly made me think of the three years in a row in the mid-1990s when KP, Ago, Strickel and I took an early April break to Myrtle Beach to squeeze as many rounds as we could into three days. Oh, the good, old days, when we were young and Ago swore that KP could plant himself into his head with a look and a word or two. Yeah, golf rounds and friendships breed stories. Two rounds in a row would do us good now, KP retired and me on staycation. The sun lasted most of the front nine. 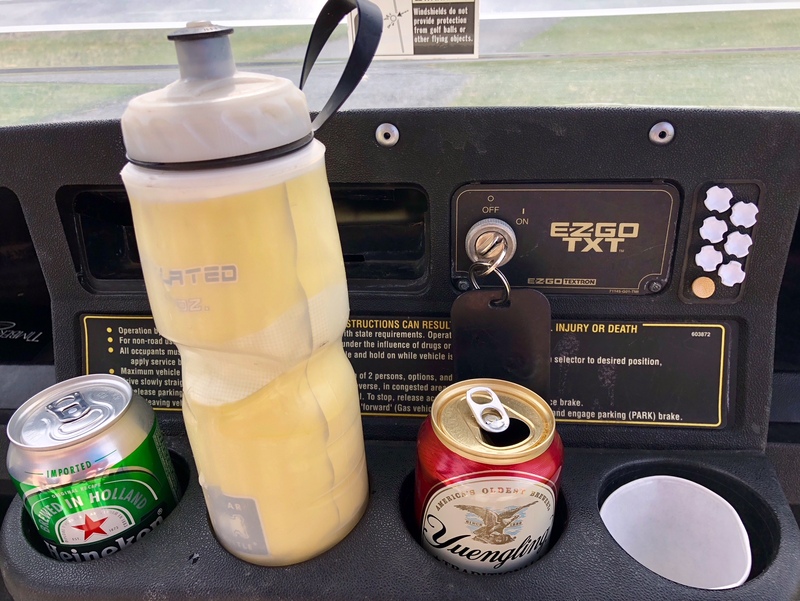 We had provisions in the cart purchased from Kim in the cart set up on the path between the ninth green and 10th tee to ward off anything that came our way on the back nine. I went with Yuengling, the brand I first sipped on the trip to play with the Long Island crew in Pennsylvania. KP chose a Heineken. The sky is the limit this season. The temperatures indeed dipped with the removal of the sunshine, and as we headed toward our finish time of 5:30 p.m. It may have even hit 62 degrees. Considering that I had to scrape snow from my car just four days prior, it was a CNY spring miracle. Ball off the club for KP. Every way we looked at if, our first two rounds on the course were a hit. Now we feel ready for Tuesday. The first day of May, you see, will bring the opening round of our new joint venture. 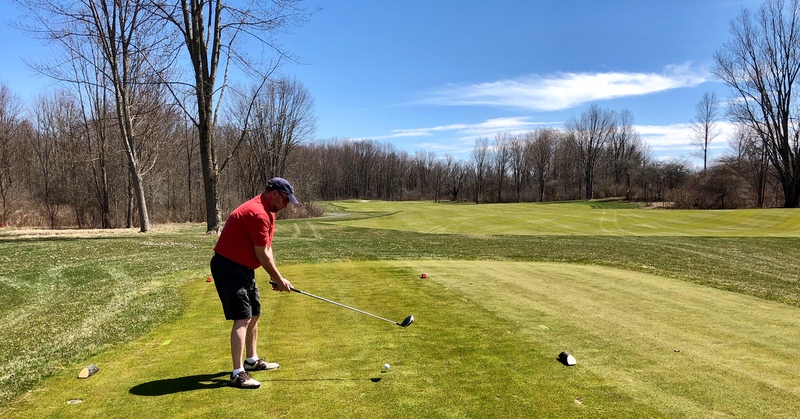 KP and I have joined a two-person nine-hole league that meets at 5 p.m. each Tuesday at Foxfire. We know we’ll have that round together to keep improving through the league tournament and banquet in September. And create, recall and share more stories. Yes, you’ll see more here. Happy putting and puttering MBM! I’ll work on both, MBC. Thank YOU, Mark, of course. Thanks for your drive, Ann. you are on a streak! 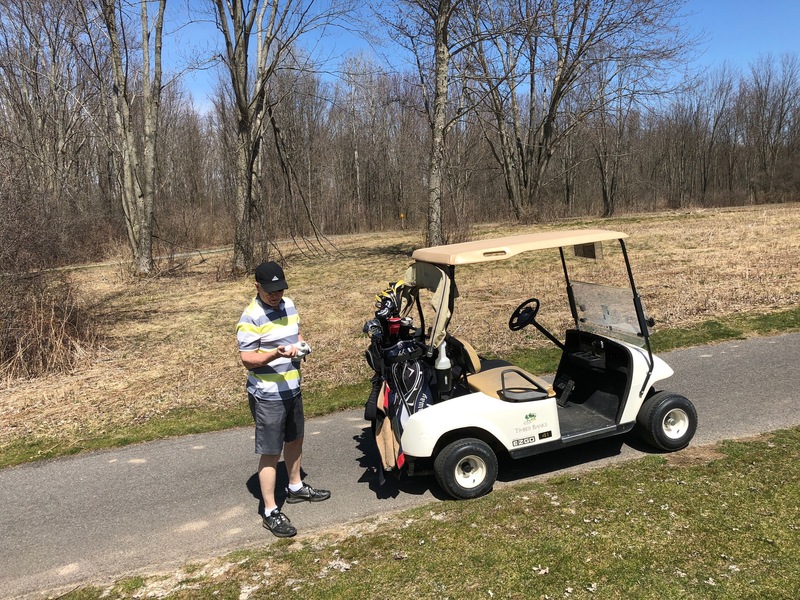 It was so nice to drive, pitch and putt again, Beth!